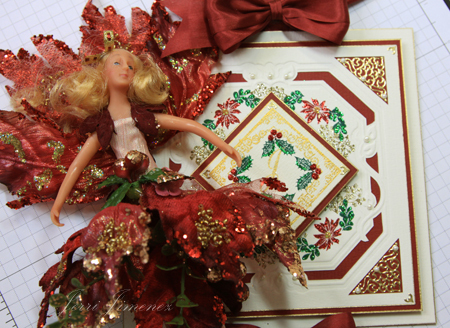 Today is the last day of my Christmas Poinsettia Table Decor series. Thank you so much for coming back each day to visit my blog during this series. 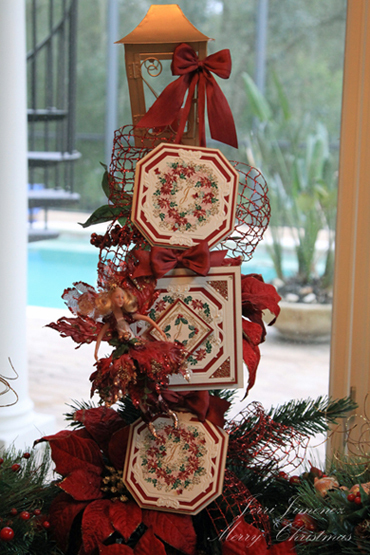 The last design I’m featuring is the wall hanging that is hung on a beautiful Christmas poinsettia lamp post floral arrangement that I purchased at Michael’s. The wall hanging is approximately 22 inches in height and 9 inches in width. The Open Passe Partouts EH 1822 was used for all three panels. 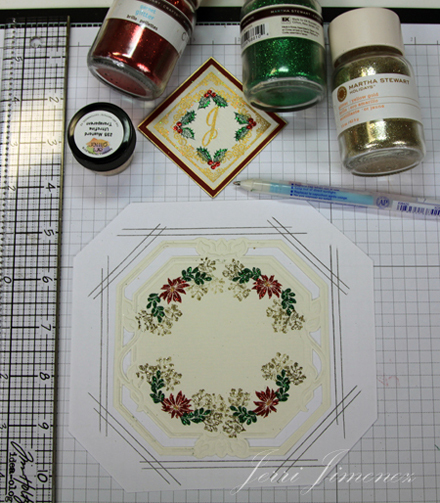 Holiday Garden and Holly Border tapestry stamps were used for the poinsettias and holly leaves. 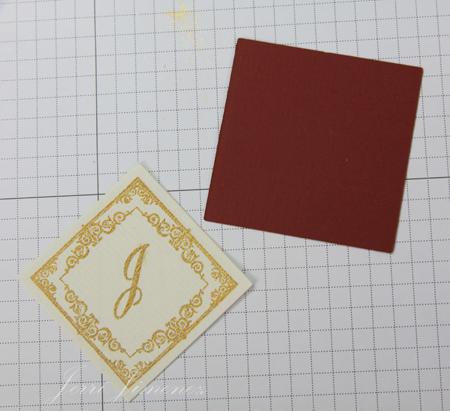 The monogramming on the three panels was done with JustRite Stamper’s the Decorative 2″ Square Monogram and Deluxe 2″ Round Monogram kits. 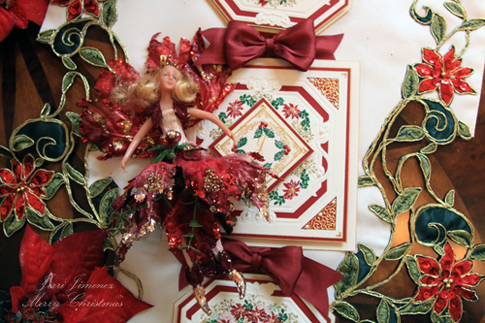 I placed a Christmas Poinsettia Fairy on the center panel. I hung the wall hanging on the lamp post by attaching the bow to the lamp. The lamp post arrangement is the centerpiece of the dining room table. I’ll be back in a day or two with pictures of my dining room. I adhered the fairy to the center panel of the wall hanging. The lower portion of the wall hanging is nestled in the poinsettias and pine of the arrangement. I placed the wall hanging on a table to get photographs of it laying flat to give you a visual of it off the lamp post. This close up shows the detail of the design. I placed tiny butterflies on the wreaths to coordinate with other designs in the series. You’ve seen these little butterflies on a lot of my designs, it’s one of my favorite punches. 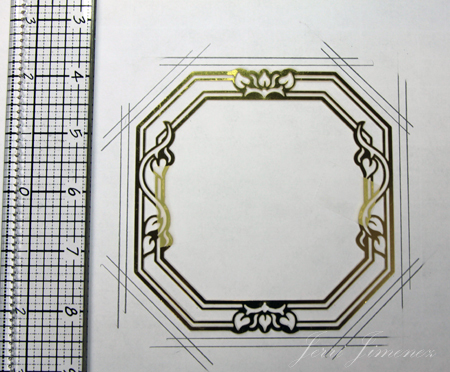 I used gold corner stickers for the cut corners on the center panel, as well as Joy! Craft Pale Yellow pearls. 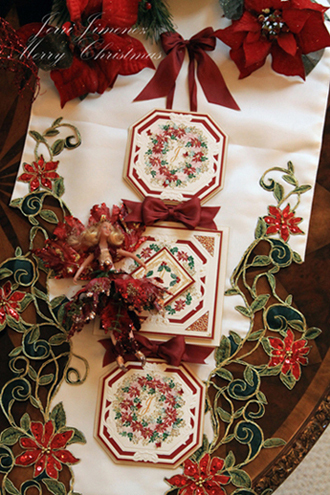 May Arts 1.25″ and .25″ silk ribbons were used on this design. The large bows were made using a Bow Easy. 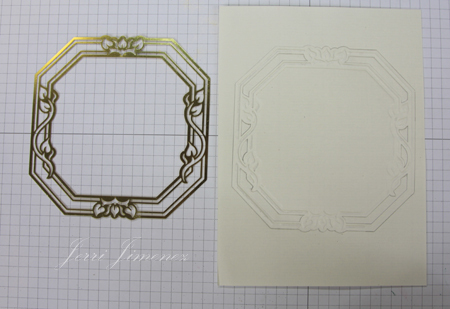 Run stencil through die cutting machine to emboss Carnation White embossing paper. 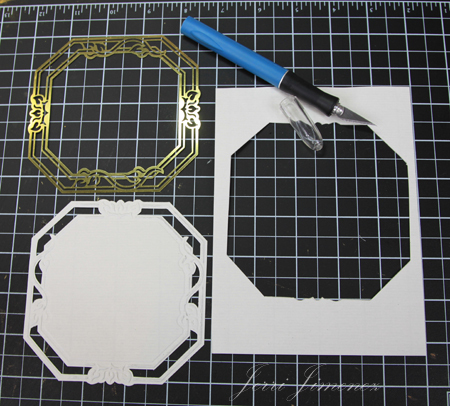 Place stencil on embossed design and draw cutting lines. 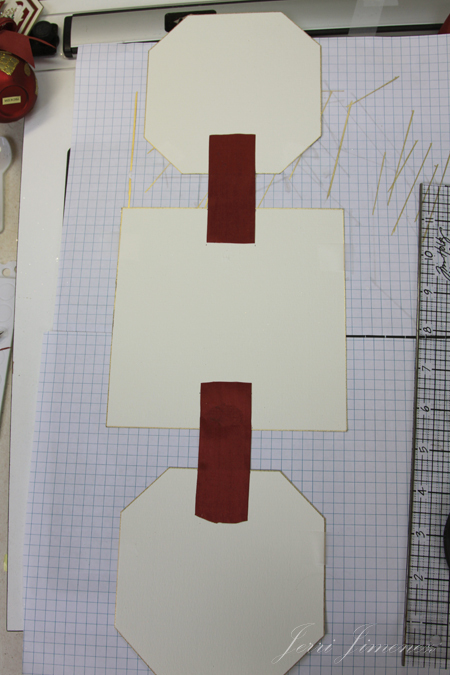 You will have three cut panels as shown. Oh too funny, I’ve just noticed that when taking the picture I turned the last panel different from the first one. Thank goodness I didn’t do that when putting the wall hanging together! 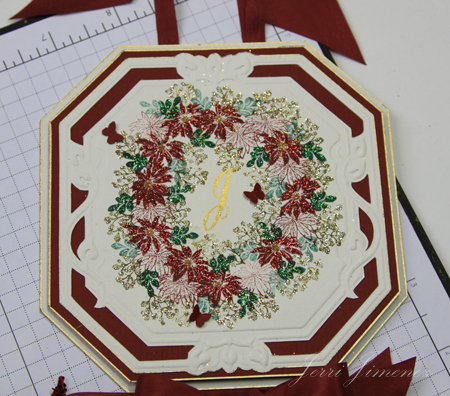 To make the template for the Christmas Red and Carnation White panels draw lines 1/8″ from the edge of the stencil and 1/8″ away from the inner set of lines as shown. 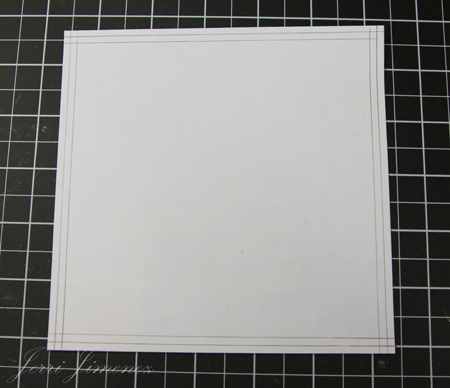 To make the template for the square panel, place your embossed square on white xerox paper (or graph paper) and draw lines 1/8″ from edge of embossed panel (for red paper panel), draw another set of lines 1/4″ from those lines for the second panel (Carnation White paper). I’m sorry, the picture above shows the lines 1/8″ inch apart. The 2nd set of lines should be 1/4″ from the inner lines. I made the first template and then decided to place the lines further out for a larger Carnation White panel. I forgot to take a picture of the re-drawn template. 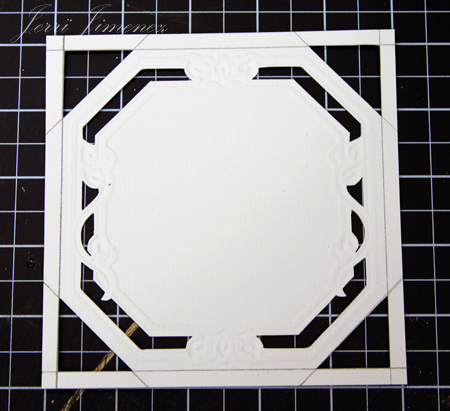 Using the templates that you have made cut two squares from Carnation White embossing paper on the outer lines of the square template and cut four octagons on the outer lines of the octagon template on Carnation White embossing paper. 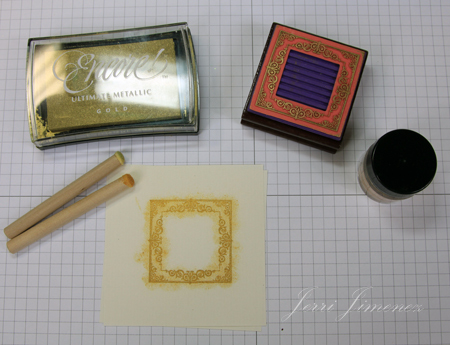 Draw around the edges of all pieces, both squares and octagons with a Krylon 18Kt. Gold pen. 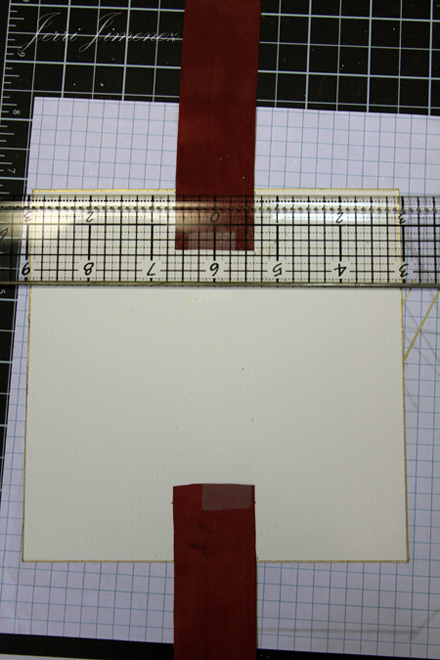 Lay out the pieces on grid paper as shown and adhere ribbon (May Arts 1.25″) with Zip Dry Adhesive between the three panels leaving a one inch space between the panels. 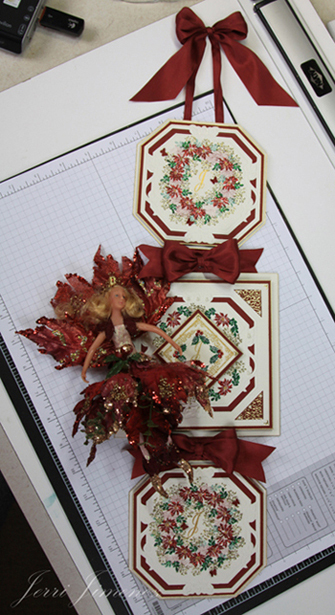 Cut two 9″ strips of 1/4″ May Arts matching ribbon and adhere to the top panel as shown above. Adhere the back portions of the panels to the front portions sandwiching the ribbons between the two layers of Carnation White embossing paper. 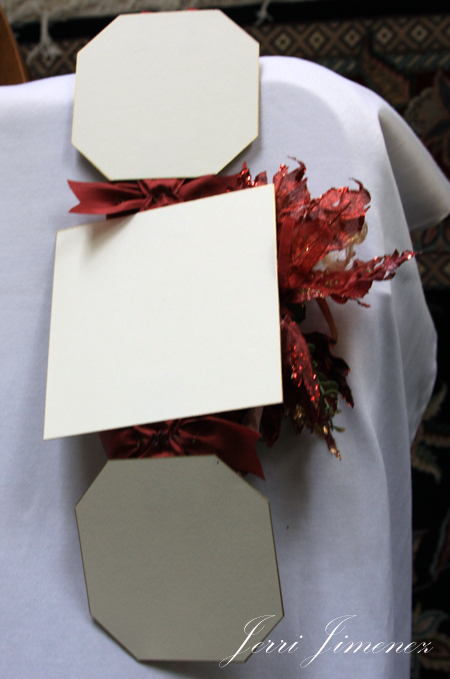 Make a large bow and attach to the top of the ribbon hanger. I sewed the bow on using a simple back stitch. I sewed a basting stitch across the mid-sections of the wide ribbon between the panels and slightly gathered the silk as shown above. Now that the panels have the ribbons attached, we’ll go ahead and adhere the finished panels to the wall hanging. 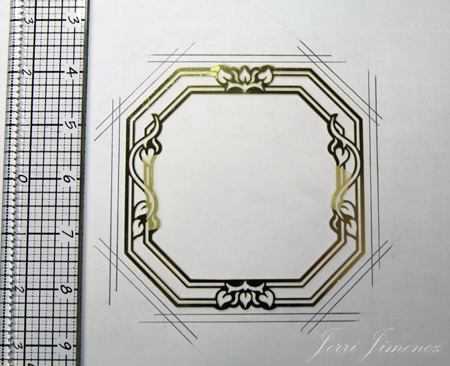 Refer to the Prayer Card Tutorial for instructions on stamping the center panel of the wall hanging. 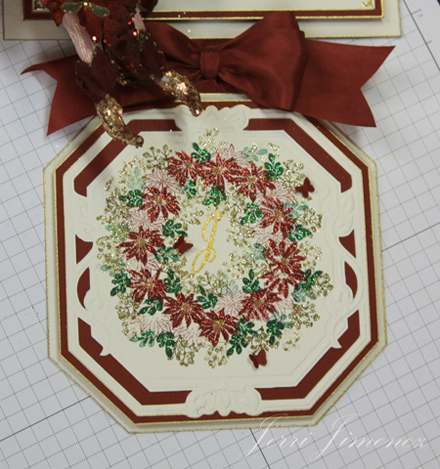 Refer to the Gift Card Holder Tutorial for instructions on stamping the upper and lower portions of the wall hanging. Once all panels have been stamped, glittered and embellished with butterflies and pearls, draw around all edges of panels with a Krylon 18Kt. Gold pen. 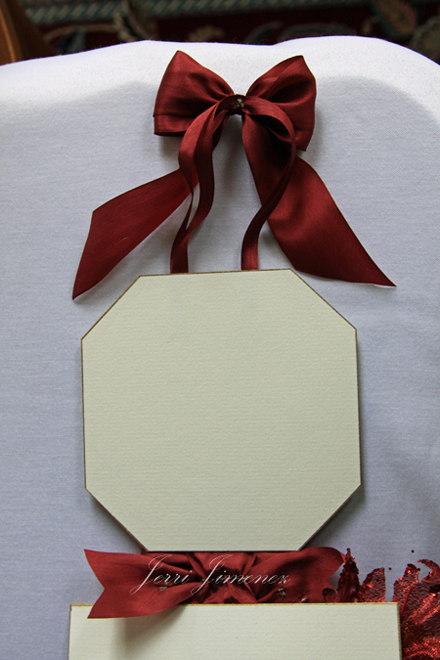 Adhere the Carnation White embossed panels to the Christmas Red panels with Zip Dry Adhesive. 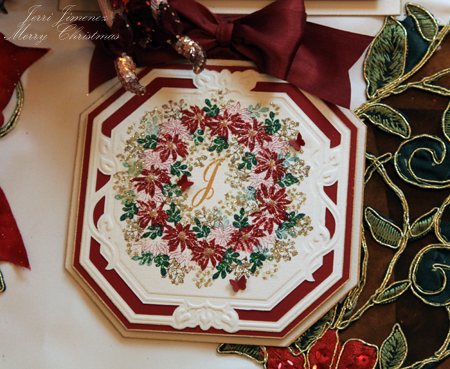 Now attach Joy!Craft 2mm Foam Pads to the back of the Christmas Red panels and adhere to the Carnation White panels. 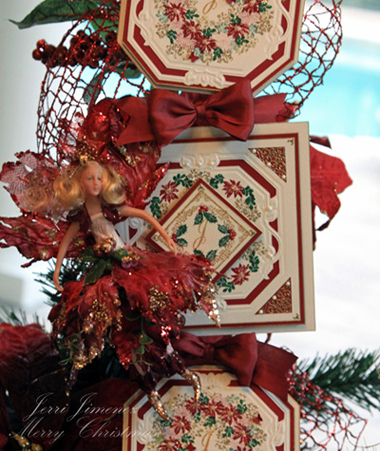 Use Zip Dry Adhesive to attach Christmas Fairy. Use a lot of glue and let set for about an hour. And there it is, your gorgeous Christmas Wall Hanging. Okay now that I’m at the end of the Christmas Ensemble series you’re probably wondering why in the world I’m showing you a bottle of glue . . . right! I was so amazed when I finished this series that I had to share this with you. I opened this bottle fresh when I started the Christmas Ensemble. I’ve used this one bottle on every single design in the entire series. So let’s see, how many pieces was it: 8 Prayer cards (including all layers and ribbon), 10 Place cards (all layers and ribbon), two table centerpieces (all layers and ribbon), two gift card holders (all layers, including ribbons and fairies), 8 napkin holders (all layers, including adhering all the floral pieces together, as well as the ornaments adhered in the centers and ribbon), and the wall hanging (all layers, including ribbon and fairy). I have a little over one-quarter of the bottle left. This bottle sells for $6.49. Is that not amazing or what! If I had used a tape runner, I assure you I would have gone through many reels of expensive adhesive. I would also assure you that my designs would be falling apart due to the heavy humidity in my neck of the woods (Tampa, Florida). I would not have been able to attach the fairies with a tape runner, the weight would have been too heavy. I would not have been able to put together the napkin holders with a tape runner. I am not trying to “Plug” this adhesive because I sell it in my store, I’m plugging this adhesive because it’s positively the best adhesive I’ve ever used! If you have a store near you that sells it, I recommend that you try it. It does have it’s cons . . . i.e., it’s smelly, but the odor disappears when dry; it can be a little stringy at times, (very easy to pull the strings off), and it dries very quickly so the cap needs to be put back on after every use. However, (and this is a little nasty), if you forget about the cap and the glue dries on the end, it can be pulled off like a booger . . . LOL! If the tip gets clogged, simply place a tapestry or craft needle down the tip and it clears the tip. 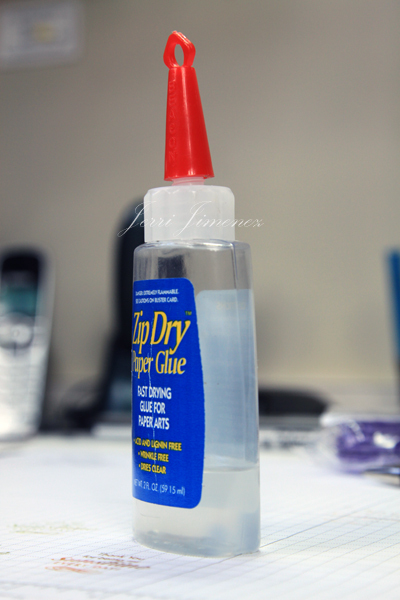 This glue will not wrinkle or warp paper, it does not leave lumps between layers, and it dries fast. For me it’s a miracle glue. I love that I have 15 seconds or so to slide my layers around if I place them on the paper crooked. I can’t do that with a tape runner. Here’s a tip: If you’re using dimensionals (foam pads), peel off the paper, place a little of the Zip Dry on the dimensionals, you don’t have to worry about getting the layer placed perfectly straight, you’ve got a few seconds to slide your raised panel into place for perfect placement of the panel. Now don’t get me wrong, I’m not totally against tape runners. I use them when I’m doing a simple card in bulk, such as Christmas cards, but 99% of the time, I reach for Zip Dry. 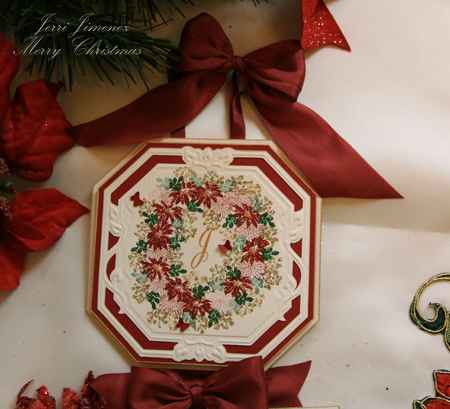 Thank you so much for stopping by each day during this Christmas Ensemble series. I will be back in a day or two with pictures of my dining room table. Thank you so much for visiting, I truly appreciate you taking time to stop by. Beautiful! Another masterpiece. When it comes to table settings, I think you leave Martha Stewart in the dust. Your work is always so elegant. Thank you for taking the time to share these tutorials with us. Another beauty. You amaze me each time. 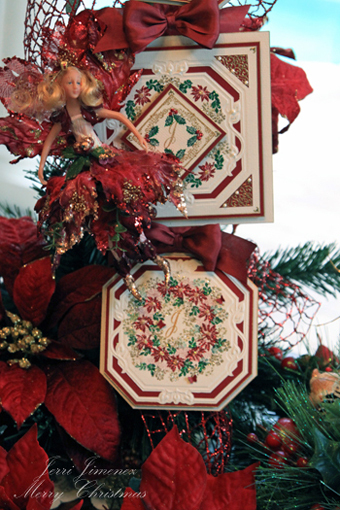 Love the embossing, stamping, glitter, fairy & intricate cutting. I can only image the time that goes into each creation. Thank you for the tutorial. Merry Christmas! Thanks for taking the time to share with these amazing tutorials. I also appreciate that you have introduced us to the uses of less commonly available products! Oh my goodness, girl. Seriously, everything you do is a total masterpiece! You AMAZE me!! All of these are just amazing. So gorgeous and elegant. I’m in awe of what you come up with and how you put it all together. Totally gorgeous, as was the entire series! I LOVE the idea of the wall hangings you do — how WONDERFUL to have so many on hand for different times of the year! Thank you so much for all the time you’ve taken on this fabulous serious! MERRY CHRISTMAS, MY FRIEND!!! 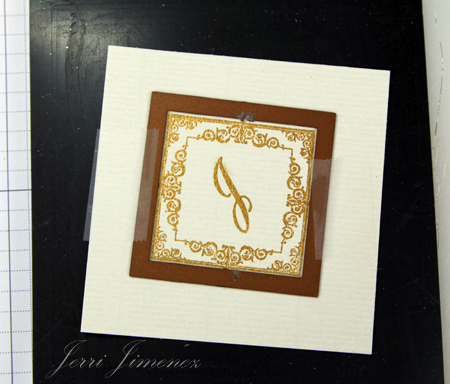 Jerri ~ I have enjoyed every picture and every word of this series…(especially laughed at the “booger” word). I am so looking forward to see the whole table! Your detail to each tutorial is very encouraging for me…but it will probably take me months to finish this masterpiece! Simply put…STUNNING!!! WOW!!!!!!! I lucked up on your website and I am glad I did! Your work is awsome! I deffinately have it bookmarked. I will be back to see more! Congratulations! This whole set is just stunning! So much detail. Your tutorials are terrific. Thanks for sharing! 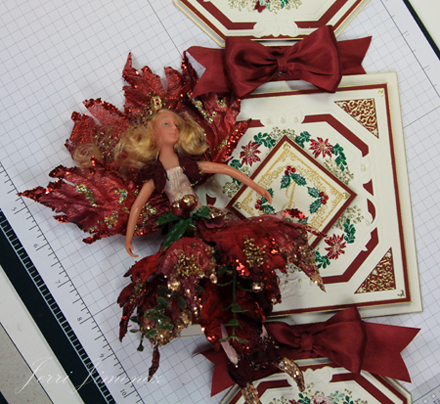 Jerri, thank you for your wonderful tutorials for this table ensemble! Each and every one is a true work of art. Thanks also for the tip for using that bottle glue. I will definitely be giving it a try. Have a wonderful Christmas w/your family, gf! OMGosh! That is just GORGEOUS! You are so talented! What a ball you must have had as those creative juices flowed! You were in your “zone.” Your house must be quiet, you work late into the night cause you only need 4 hours sleep, OR your hands fly through your projects. Whatever … you are an inspiration to push ourselves a bit more to do the elaborate stuff. I look forward to seeing more or your creativity in the months to come. Another beautiful creation. Absolutely stunning. The colors alone are so festive and elegant. Just gorgeous, Jerri! 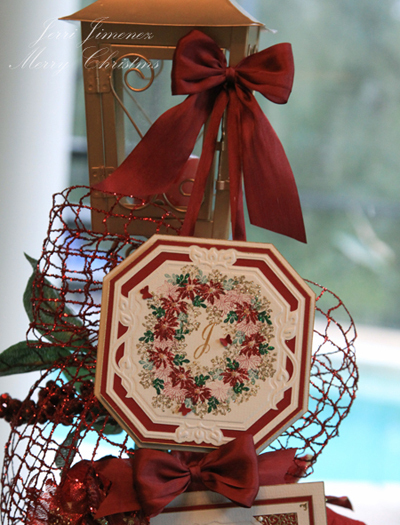 I also love special holiday wall-hangings… they add so much! Jerri have I ever mentioned that I want to be you when I grow up??? 🙂 I have to subscribe to your blog so I can get depressed more often!! 🙂 These are so lovely.